The Johns Hopkins University Applied Physics Laboratory built and operates the twin Van Allen Probes spacecraft for NASA's Living With a Star program. The Van Allen Probes operate entirely within the radiation belts throughout their mission. When intense space weather occurs and the density and energy of particles within the belts increases, the probes do have the luxury of going into a safe mode, as many other spacecraft must do during storms. The spacecraft engineers designed probes and instruments that are "hardened" to continue working even in the harshest conditions. 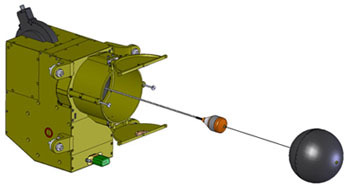 The twin probes carry a number of instruments and instrument suites to support five experiments that will address the mission's science objectives. 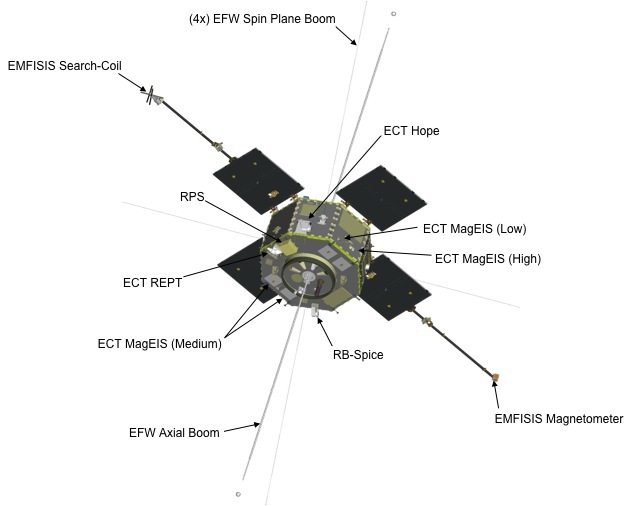 Because it is vital that the two craft make identical measurements to observe changes in the radiation belts through both space and time, each probe carries the following instruments. ECT will directly measure near-Earth space radiation particles to understand the physical processes that control the acceleration, global distribution, and variability of radiation belt electrons and ions. ECT's three highly-coordinated instruments (MagEIS, HOPE, and REPT) cover comprehensively the full electron and ion spectra from one eV to 10's of MeV with sufficient energy resolution, pitch angle coverage and resolution, and with composition measurements in the critical energy range up to 50 keV and also from a few to 50 MeV/nucleon. All three instruments are based on measurement techniques proven in the radiation belts, optimized to provide unambiguous separation of ions and electrons and clean energy responses even in the presence of extreme penetrating background environments. MagEIS uses magnetic focusing and pulse height analysis to provide the cleanest possible energetic electron measurements over the critical energy range of 30 keV to 4 MeV for electrons and 20 keV to 1 MeV for ions. 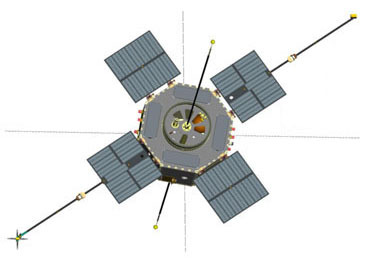 HOPE uses an electrostatic top-hat analyzer and time-gated coincidence detectors to measure electrons, protons, and helium and oxygen ions with energies from less than or equal to 20 eV or spacecraft potential (whichever is greater) to greater than or equal to 45 keV while rejecting penetrating backgrounds. REPT covers the challenging electron range of 4-10 MeV and proton energy range of 20-75 MeV to capture most intense events. For more information, go to the ECT web site. The EMFISIS investigation will focus on the important role played by magnetic fields and plasma waves in the processes of radiation belt particle acceleration and loss. EMFISIS offers the opportunity to understand the origin of important magnetospheric plasma waves as well as the evolution of the magnetic field that defines the basic coordinate system controlling the structure of the radiation belts and the storm-time ring current. Tri-axial Magnetometer (MAG): MAG is a tri-axial fluxgate magnetometer: Vector B, DC-15 Hz, 0.1 nT accuracy, three sensors on rigid boom. This investigation consists of a set of four spin-plane electric field (E-field) antennae and a set of two spin-axis stacer (tubular, extendable) booms. The investigation will provide understanding of the electric fields associated with particle energization, scattering and transport, and the role of the large-scale convection electric field in modifying the structure of the inner magnetosphere. Coherent and stochastic acceleration and scattering of particles by small-scale, large-amplitude plasma structures, turbulence and waves (electromagnetic and electrostatic ion cyclotron waves, kinetic Alfven waves, solitary waves, electron phase space holes, zero frequency turbulence). The dynamics of the Earth’s radiation belts are all about particle energization, scattering, and transport; in other words, particle acceleration. ...from the slow pumping of particles by ULF waves, to the scattering and energization by high-frequency whistlers. RBSPICE will determine how space weather creates what is called the "storm-time ring current" around Earth and determine how that ring current supplies and supports the creation of radiation populations. The geomagnetic field drives relativistic electron motion via time-dependent gradient-curvature drift. Thus, structural variations of the inner magnetospheric field due to storm-time ring current growth control transport and losses in the outer belt. 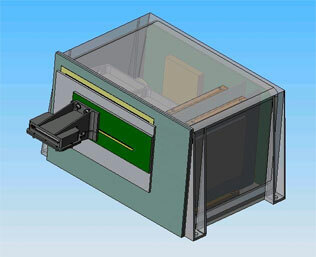 This investigation will accurately measure the ring current pressure distribution, which is needed to understand how the inner magnetosphere changes during geomagnetic storms and how that storm environment supplies and supports the acceleration and loss processes involved in creating and sustaining hazardous radiation particle populations. Measurement Requirements: Hot plasma pressure must be derived to calculate the ring current contribution to storm-time magnetic fields. Thus, it is necessary to resolve the full energy spectrum of the ring current as well as its composition (H, He, O). Ring-current ion composition, pitch-angle, and energy sensor. RBSPICE-Puck covers the full range of expected ring current intensities, from quiet to extreme events, with a factor of 10 margin against saturation. 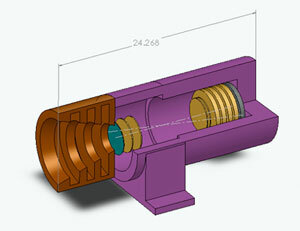 Measurement quality is independent of the angle between the B-field and the spin axis. 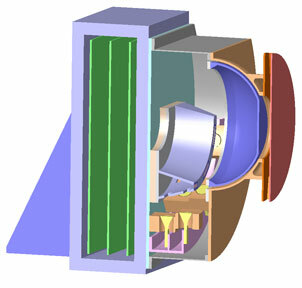 Ion composition energy range is low enough to determine the complete Ring Current energy density. More information about RBSPICE can be found at http://RBSPICE.ftecs.com. The RPS will measure inner Van Allen belt protons with energies from 50 MeV to 2 GeV. Presently, the intensity of trapped protons with energies beyond about 150 MeV is not well known and thought to be underestimated in existing specification models. Such protons are known to pose a number of hazards to astronauts and spacecraft, including total ionizing dose, displacement damage, single event effects, and nuclear activation. 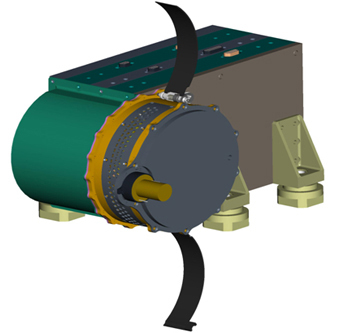 This instrument will address a priority highly ranked by the scientific and technical community and will extend the measurement capability of this mission to a range beyond that originally planned. 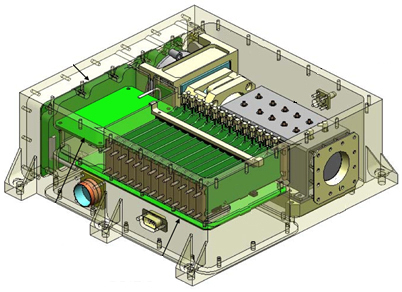 The project’s goal is development of a new standard radiation model for spacecraft design. How do solar energetic particle (SEP) events, large magnetic storms, and shocks/sudden commencements modify the Inner Belt? What, in addition to cosmic ray albedo neutron decay (CRAND), determines the steady-state inner belt?